From 14. to 16. 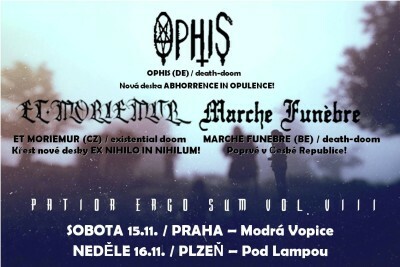 November we will be on tour with OPHIS (DE) and MARCHE FUNÉBRE (BE). We will play in Leipzig, Prague and Plzeň. It´s the eight edition of our PATIOR ERGO SUM doom fest. Come to claim your dose of melancholy before winter comes.